This is a repost from my old mothballed blog, this project still gets interest. 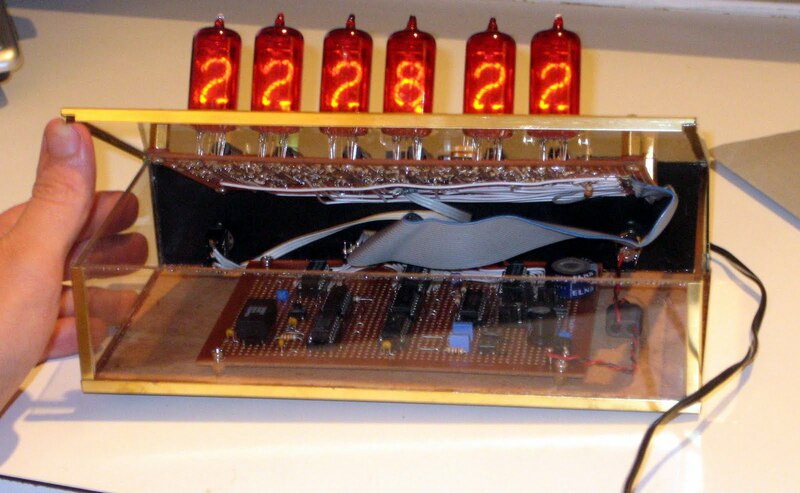 For the last couple of years I've been keen to build a nixie tube clock. 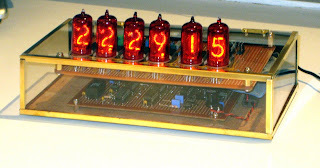 Nixie tubes are those early (1950's-70s) display tubes often used in industrial and commercial applications, before the advent of LEDs and LCDs. They novelty and attractiveness led me to finally wanting to build one, but it wasn't until after I'd moved back to Sydney from Holland that I was able to get around to it. 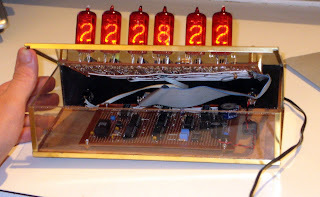 My clock is built entirely from scratch, and is based on 4000 series logic ICs for the actual clock counting, and 74141 chips for the tube drivers. It's self contained, requiring only a 12v AC/DC plug pack to run. It features 6 digits (HH.MM.SS), buttons for setting hours, minutes, and zero seconds, 1 minute per year accuracy, supercap power backup and an LDR to shut the display off after a predetermined period of darkness (switch overridable). 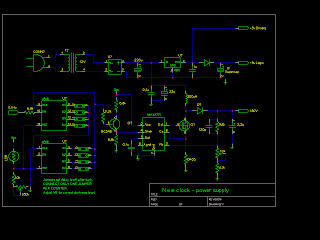 The schematic for the clock is show below. 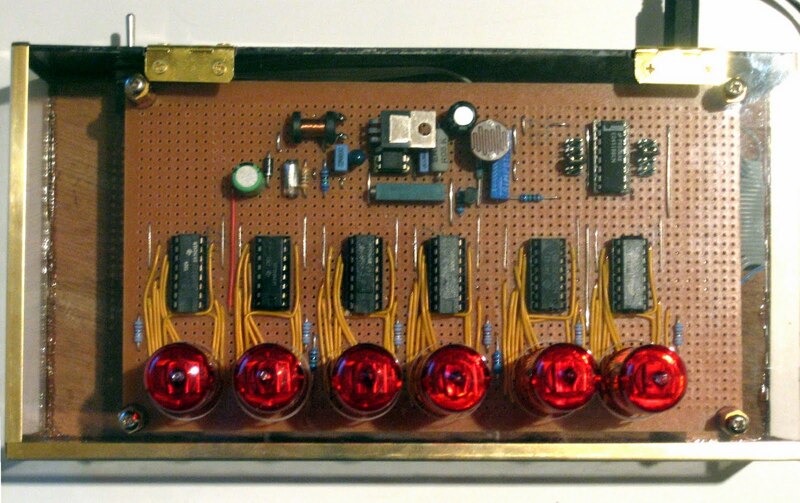 The first circuit shows the power supply circuitry, and the second shows the guts of the clock. 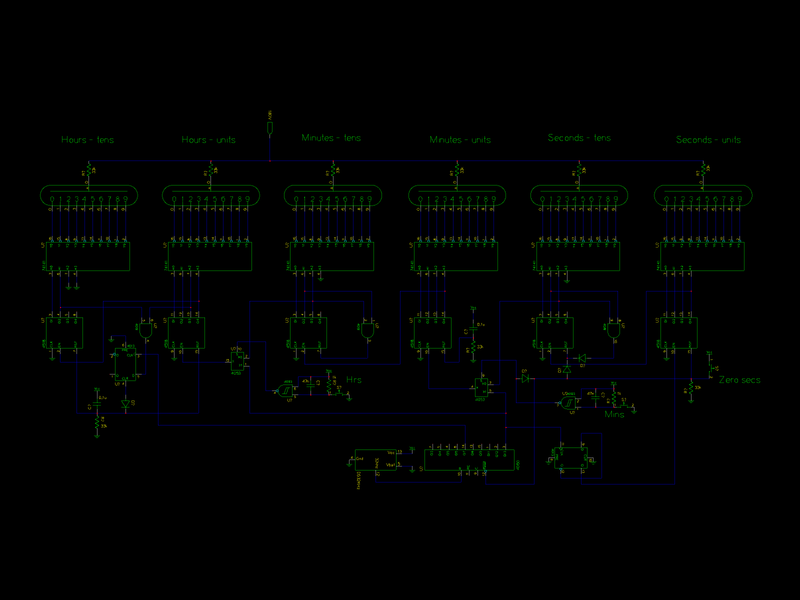 You can download the circuits (for gschem) here. 5v Power supply consisting of a rectifier and standard 7505 voltage regulator. The driver and logic supplies are separated with a diode - its purpose is to allow the logic circuitry to be backed up by a 1 farad supercap (the rightmost cap) whilst shutting down the 74141 power when the power fails. 74141s take a LOT of power (~80ma total) and this would otherwise drain the supercap quickly. I get about 1.5 hours backup from the supercap. 180v supply provides the necessary voltage to drive the nixies. They generally strike at 140 volts, but 180volts is considered optimal for reliable operation. This supply is based around a Maxim MAX7771 chip, which I got as a free sample from their web site. The Mosfet came from an old PC monitor and ~300uH inductor and fast recovery diode came from the same. From this supply, I get about 88% efficiency (not bad for stripboard!). The dark sensor is based around an LDR and 4518 counter chip. 0.1Hz pulses from the main clock logic drive the 4518 counter, and when it reaches a count (programmed via jumpers), the BC548 turns on, bringing the SHUTDN pin on the MAX1771 high and turning off thie nixies. When the LDR is illuminated, the counters reset pin stays high, keeping the supply running. At the back of the clock is a switch with 3 positions to manually set the tubes off/on or auto. Accurate timing is provided from a Maxim DS32KHZ clock chip, also received as a free sample. This chip is advertised with an accuracy of 2 minutes per year from 0-40C, and reports have it as less than 30s per year at normal domestic temperatures. 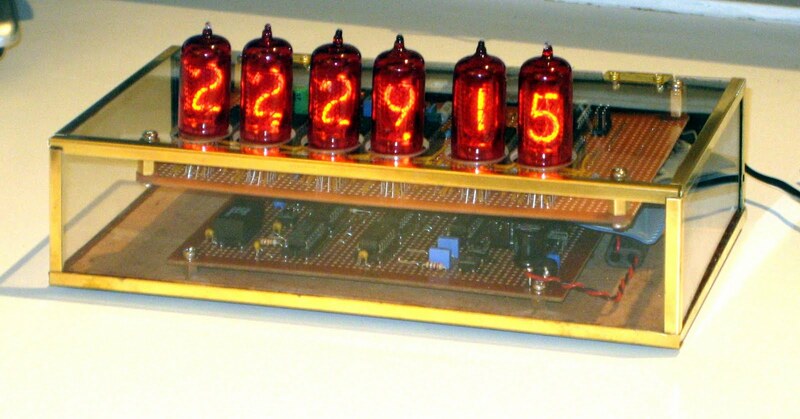 The highly accurate 32KHz from this clock powers a bunch of 4518 decade counters. Some standard logic is used to count to 60 and 24 in the normal clock display. Time setting is done using a 4053 analogue switch chip, which controls the clock source of each element to allow a press of the hours or minutes button to redirect a 2Hz pulse to each segment for setting the time. Because of the seconds feature and accuracy, I also wanted to be able to accurately set the seconds on the clock. This is done with a third button which zeros the seconds. A 4093 schmitt trigger chip debounces the switches. Nixie drivers are standard 74141 chips. They are fed directly from the 4518 outputs. The clock is built on two strips of standard stipboard. One has the power and logic circuitry, and the other has the nixie tubes, drivers and PSU. It's all assembled in a home made case made from wood, perspex and brass strips. Cutting the holes for the nixies proved to be the most challenging aspect, but my dremel dod the job nicely, leaving me with perfectly circular holes for the tubes. Alignment for the plastic was a little tricky, but it's mostly lined up, except for a mm or so for the lid, but it can flex slightly to compensate. The logic board is mounted on the wooden baseboard, and the driver board is mounted under the lid. 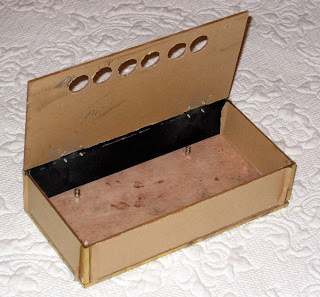 The tubes are mounted high enough off the PCB to stick through the holes, whilst allowing the rest of the parts to sit under the lid. I mounted the lid with a hinge, allowing easy access to the innards (the set switches are on the logic board). 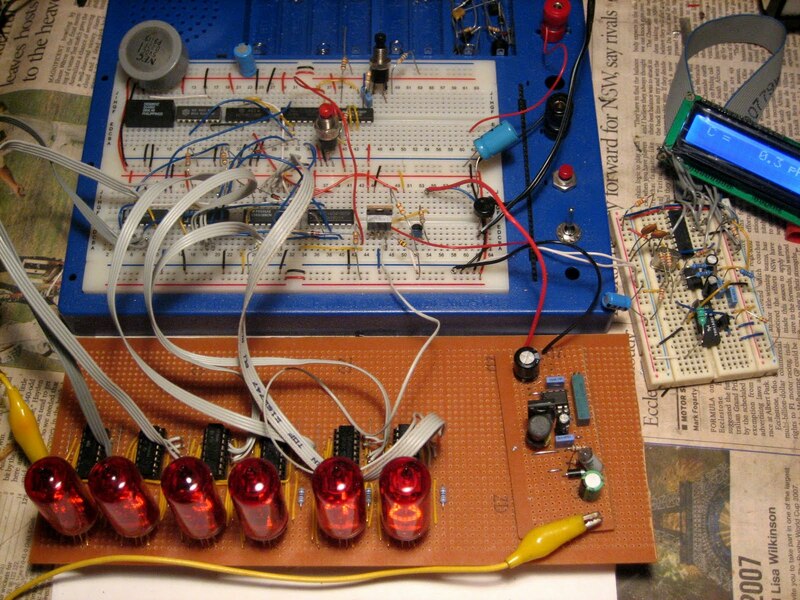 The development of the clock electronics was done on solderless breadboard. This allowed me to verify operation and fine tune any aspects of the clock. 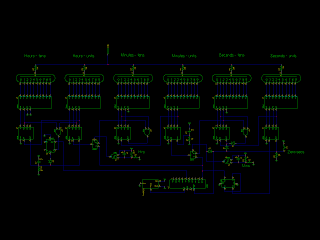 This ended up being very important as I had to work out some clever things for the time setting and daily rollover circuitry. As a result, I only had to make two minor changes to the clock after assembly. 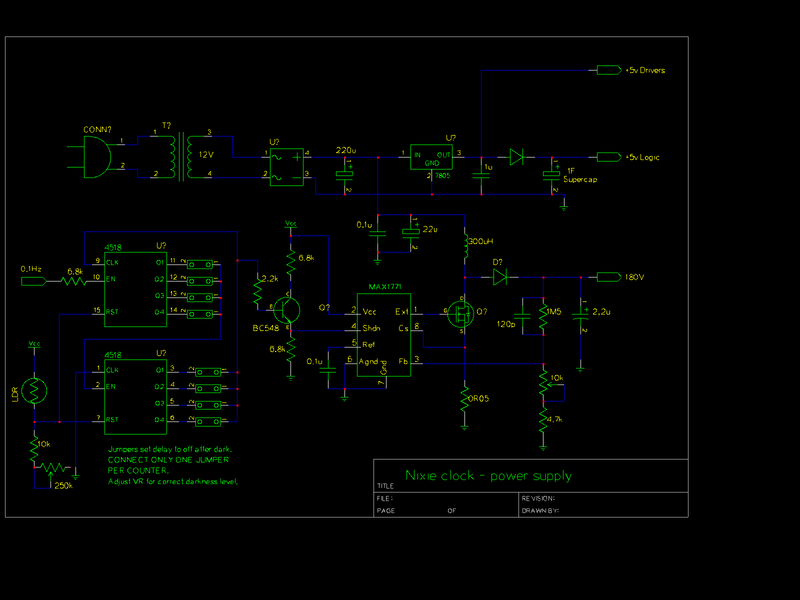 Below is a picture of the clock on a breadboard (after I'd started the display board). To the right is a homemade LC meter I used to get the inductor right. Now that it's built, I am very happy with it. A major project is finally complete and it's so satisfying to know that I've done it all myself. It's even better than from a kit! The Maxim free samples program has been very useful to me for some key components, as was ebay for the tubes! What kind of tubes did you use? Good question, I'll have to look at them closely. I know they are Japanese tubes, perhaps NEC.